I am hung up on titles. Not the corporate or job ones, but I have this penchant for catchy titles of my blog posts, stories or essays. Titles are the quintessence of the text. In fact, when I was younger, I would often write the title first and then stare at it lovingly till it gathered mass and momentum of its own and started spinning the story! But this strategy had its drawbacks. Sometimes, the whole plan would be abandoned, only because the title stopped short in its tracks and didn’t take things any further. Things have improved, and I have learnt that the title will happen eventually. But somehow, I keep getting stuck on titles, which play on my mind, in a little ticker strip right from the start, through the development of the story and sometimes just before finishing off. I find myself partial to strategies like puns and alliteration and have an affinity for colons, hyphens and exclamation marks. Mind you, catchy can sometimes get tacky and looking back, I do cringe at some of the titles of my blog posts. Having said this, I am very happy with most titles and think they are efficient and effective. So when occasionally a reader asks me to classify or categorise the posts with names of dishes as the first level title, I am a little nonplussed. You see, at university doing my Master’s, one semester I signed up for a very innovative course designed and delivered by Dr. Sudhakar Marathe titled something like “The Beginning: Strategies for Foreshadowing”. He was one of the younger academics, new to the department, a shot in the arm for the near retirement brigade of some of India's most erudite academicians. His new, very democratic and energetic style of teaching caught our attention while the innovative courses he introduced each semester enthused many. This particular course was unlike any I had seen and I was instantly game for it. Exploring the presaging techniques used in texts ranging from the Medieval “Sir Gawain and the Green Knight”, the Gothic “House of Seven Gables” to the modern “Heart of Darkness”, Dr. M took me on this very fascinating journey of how writers deployed almost guileful, devious strategies to capture the attention of the reader and keep them engaged in a very participatory way. Foreshadowing, as many of you might know, is a technique used to develop an expectation or a mental preparedness of the reader to launch into the story. It creates tension and constructs the mystery around what is slowly unfolded. Metadata, data about data, or information about the story, at times external to the text) can also be used to create foreshadowing. This is evident in titles or sub-titles of books, films or blogs (!) that hint at the action that is going to occur -or dish that is going to be presented- or both! I was agog and immersed in this novel course, but suffered from the typical impatience and incredulousness of youth. So when Dr. M thought my final essay submission for the course was worth being included as one of the chapters in a book he was writing at that time, I was ecstatic, but disbelieving. Yes, the key words there were ‘with a lot of reworking’. I never took up that offer, and probably missed out on a career as an academic, but the lessons learnt in the course resonate to this day. 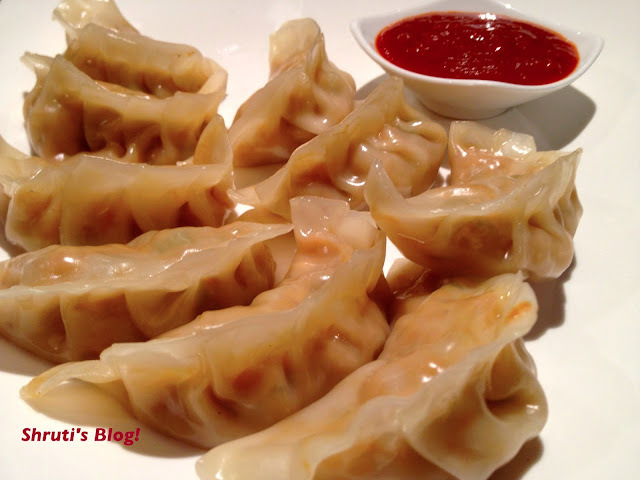 In titling this post, I am pandering that predilection, hoping to provide the subliminal sense that these Gow Jee dumplings are but momos served with a tomato achar, in the eponymous skins. I used readymade Gow Jee wrappers that we get in the deli section of the supermarkets. You could use wonton wrappers as well. Knead the ingredients into a smooth and stiff dough and keep covered for half an hour. In non-stick pan heat the oil and add methi powder, chopped onions and sauté lightly. Add garlic, ginger, chillies and the five-spice powder and sauté a little. Add the chopped vegetables and stir-fry, working the mixture all the time to keep it dry. Add the crumbled paneer, spring onions, chopped coriander, vinegar, salt and pepper to taste and mix well Remove into a bowl to cool completely. Remove the Gow Gee wrappers from the pack and keep covered with a very damp (almost wet) cloth while you fill them. I discovered this trick when I found the readymade wrappers a little too tough and difficult to fold and crimp until I made them damp. Wet one wrapper all around the periphery so it sticks. If you are using home made pastry, divide the dough you have made according to the instructions above into equal portions and roll into small thin discs. Take care to keep the edges thinner than the centre. Place a spoonful of the filling in the centre of each disc and bring the sides together in the centre holding them to make a half circle. Pinch a small piece of the dough on the side closest to you and crimp it into the other side. Continue this action of pinching, which will give you the pleat and the crimping which will join the two sides until you reach the end. Make sure that both sides are firmly crimped together. Place the ready dumplings in an oiled bamboo steamer or flat colander inside a large pot of boiling water, just able the boiling water. Steam for 12-15 minutes until the dumplings are cooked to your liking. Remove on a platter and serve with the tomato chutney or any oriental dipping sauce. In a sauce pan, heat oil and add the onions followed by the garlic and ginger pastes. In a minute, add all the spices, sauces and tomato paste and stir a little. Add gur or brown sugar a little water and let the mixture cook for 5-7 minutes, until reduced. The mixture will look glossy and let out the oil. Add salt and white pepper to taste and cool. Looks very delicious. I love it with the tomato chutney too. Thank you, Ansh! They are very easy to make- really! Scrumptious, Yum, Salivating........ I could go on with the superlatives, Here's a BIG Thumbs up from me. One clarification though, why use self raising flour? I used self-raising flour when I made the pastry at home for it gives a lovely texture. Whereas the ready made Gowgee wrappers are made with plain flour.